These 12 poker game software reviews includes the entertaining cast of characters of Poker Night 2. This article is also one of the 10 video game genres reviewed. 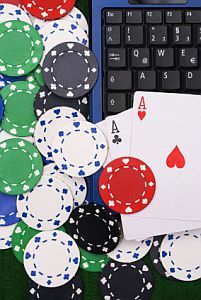 Poker software is an indispensable tool for a new or veteran player. It provides the best simulation of the game to train for the elusive game of poker, run reports, show statistics, display information about one’s game by reading hand histories of one’s opponents. We looked at several types of software available for this genre article and found them to be varying in types of games, settings and style. This genre article lists individual poker games and tournament software in that order. We have noted some of the low points or bad reviews received by some of the software, however, your mileage may vary. We do not believe that these thumbs down opinions should exclude the software from this review list. Having said that, I believe there is total agreement with the premium software from Wilson, so let's begin with their products. 1) Texas Holdem and Wilson software, Turbo Texas Holdem are made for each other. Features include the ability to create your own personal player and opposing player profiles. Therefore, the user can modify the playing styles of each player to create the type of game you want to play. You can also set the player line-up for a hand, thereby determining a loose, tight, or average style game. Turbo Texas Hold’em can be played with two – ten players in each game. You control the game by determining the blinds, bet amounts and difficulty of the game. Each update for this poker games software presents features like technology that closely simulates a real poker game, simulated players who play like humans vs. computers, advice during each hand and custom graphics. To add to your overall poker experience, Wilson keeps moving forward with poker game software that uses artificial intelligence, extended modes of play to choose from, programming to help you study your opponents, and 60 different player faces. The realty of poker play is likely the single factor that places this resource high on the poker game software reviews list. 2) Omaha is another popular game played by passionate poker players and Wilson steps up again with Turbo Omaha Hi-Low. Again, the features permit creating player and opponent profiles, determining tight or loose play and can be a 2-10 player table. Further, you determine the blinds and bet amounts and a point counter on the screen can be viewed for assistance. Also, hand analyzers and poker tips help to make the simulation players appear lifelike. Once again, Wilson 'scoops' the pot for reality poker play. 3) Stud poker is well represented here with Wilson's Turbo 7 Card Stud. One of the outstanding features is creating profiles for both your opponents and you, as the player by skill level. Designed for 2-8 players, you can set the play for each hand by determining skill level and bet amounts. The hand analyzers allow more accurate playing of the simulated players, which is the true 'bring in' feature of this software. In conclusion, Wilson poker software claims to produce the most realistic simulation of poker nowadays. But, users and reviewers say that their interface can be difficult to set-up. This poker software offers the innovative feature of allowing one to analyze his/her game and study a certain situation, thus the name. It also enables players to put up various profiles to test different techniques for many poker situations. It is sure to spike your holdem play. This software is labeled as the little brother of the Holdem Inspector 2 poker game software. Though it has the ability to track up cards and outs, the available profiles are not that commendable. Also, it does not allow you to run complex simulations. This software has bad reviews on its belt. This Texas Holdem poker calculator boasts it can fully analyze complex pre-flop situations about 100 times faster than other available tools. This resource is said to be one of the most well-developed software since their original version. Its features are the ability to automatically track stats, import old hand histories, and offering advice on how to improve the game. gamerisms' Poker Game Software reviews has Poker Office worth the money spent. This poker game software claims to have an easy installation feature and a smart computer advisor. It has an internet play and watch play for the purpose of easy learning. This poker game software is a good download for the cell phone. This is the mobile version of the Texas Holdem software. The software is good to kick boredom away while using your mobile phone. The downside of this program is that play is limited to five characters that have predictable playing strategies. Thus, reviews are mixed and it may be more qualified as a video game. With this cue, gamerisms has included this poker game software reviews article in the list of Video Games genres. Among all types of poker played, tournament poker is the undisputed leader. Below are 2 poker game software reviews for this genre. This poker game software provides all of the tools you need to host a tournament. Poker Tournament Manager has unlimited levels allowing you to determine breaks, calculates pay offs and chip additions. It also has a feature that allows you to track player statistics over multiple tournaments. Setting up the tournaments can be tedious but this software is equipped with a tournament assistant to help you determine the details and create custom play. There are numerous colors, graphics plus audio/video add-ons for you to choose. Players prefer this software because it is easy to use. Poker clock with unlimited levels and breaks. Support for buy ins, re-buys, chip add-ons, and point systems. Automatically calculates fixed or percentage based payouts. You can even randomly assign seats and balance tables as players go out. Track Player Stats and Post Results. View stats and points to see top players over multiple tournaments. Results and stats can be shared with other players by auto-posting results. Customizable tournament structure, audio and visual notifications plus color and screen options. Poker game software review of this software notes that it offers a variety of game modes, game changes between rounds, and a variety of limits. The Tournament Director automatically calculates all of the numbers such as pot amounts, chip counts and buy in rates. This software also calculates player statistics over a number of games played. Keep track of your poker league on line for free. Tournament Director automatically seats players and suggests places to play in order to keep the tables balanced. Poker players prefer this software because it is easy to operate, can simulate real life poker situation, and offers several customization options. Handles guaranteed pot, house contributions, formulas for awarding points, multiple rakes and player bounties. Calculates statistics over multiple tournaments along with schedule and prize suggestion tools plus chip calculator. Also customizable hotkeys. Make changes 'on the fly' while your tournament is running. Export rounds, players, prizes, to various formats. Export the tournament results to HTML to share with your players. Save your rounds structure, prizes, layouts, chips, independently as templates for future tournaments. Now for something completely different, here is a review of the vastly entertaining Poker Night 2. One poker game that definitely gets a mention for poker game reviews is the excellent Poker Night 2 by Telltale games. Ironically, the same company who made The Walking Dead game also produce a great poker game that is not only an amusing game of poker, but one that can elevate your poker play in real time as well. The presentation of Poker Night 2 is top of the line concentrating attention to detail. Thanks go to Telltale who is recognized for innovative and polished games. Thus, Poker Night 2 sets the bar high. The real charm of this game is your impressive opponents. Ash from the Evil Dead and Sam from Sam & Max are but a couple of your poker buddies. The awesome dealer is GLaDOS from Portal. No other poker game challenges your play utilizing this formidable cast of characters sitting at the table. As to actual game play of Poker Night 2, it is very simple and that is not a bad thing. Many poker game reviews will knock a game for not being really tough, but that is where Poker Night 2 shines. It's fun and friendly presentation eases you into the world of poker. 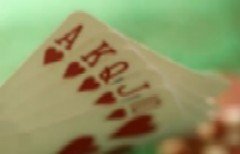 This is a great introduction to poker for new players to facilitate their way through the basics of the game all the while having an amusing poker experience. Tournaments start with a $20,000 buy-in and after a number of hands, continues until each player either runs out of cash, gets knocked out or is the last one at the table. gamerisms welcomes your comments/suggestions about these poker game software reviews. Along with this poker software article, the Poker Glossary at gamerisms is extensive with 5 parts and a Quiz.